Hello there. My poor little blog has been suffering this year, but a lovely email from a special bloggy friend has prompted me to post. My blog might be quiet but life has been going on at its usual rapid pace. 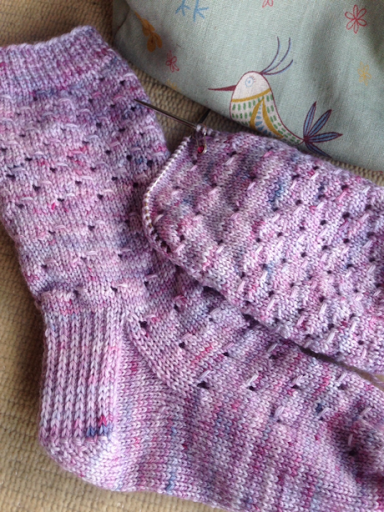 I have been knitting socks and shawls, English paper piecing diamonds and a little applique. Some exciting things have happened too. 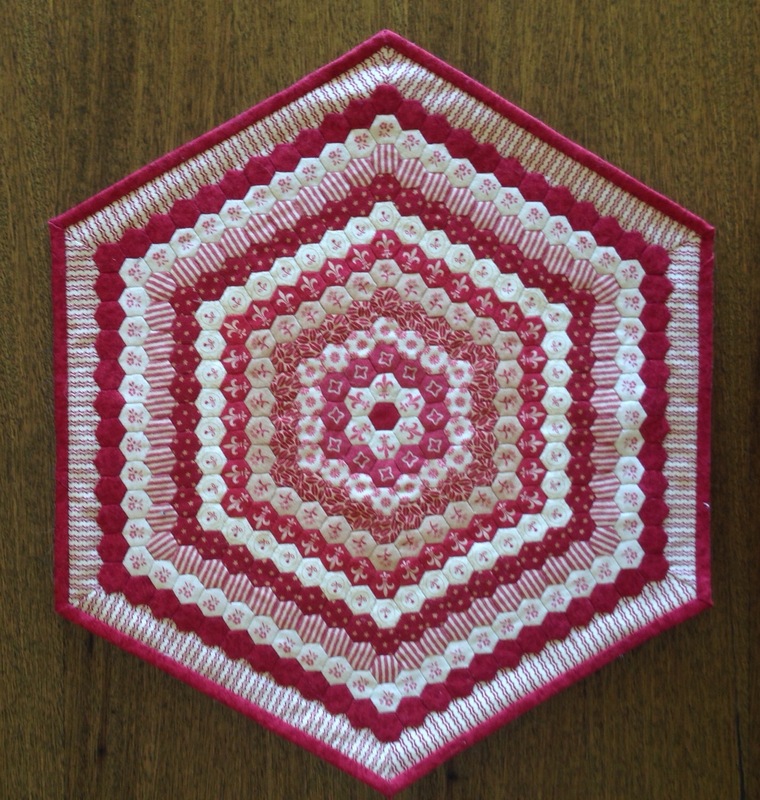 This little favorite of mine won second place in the Miniature category at the Sydney Quilt Show in June. I have wondered for ten years if a quilt of mine would ever be exhibited there, let alone win a prize. What a great experience it was. 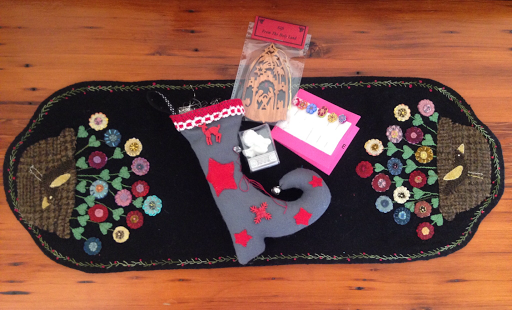 I loved doing my white glove duty too, and spending a crafty weekend in Sydney with the Cassilis Quilters. It was also exciting to see my own design, Doing The Rounds hanging at the show. It didn't win a prize, but it's my favorite quilt ever. 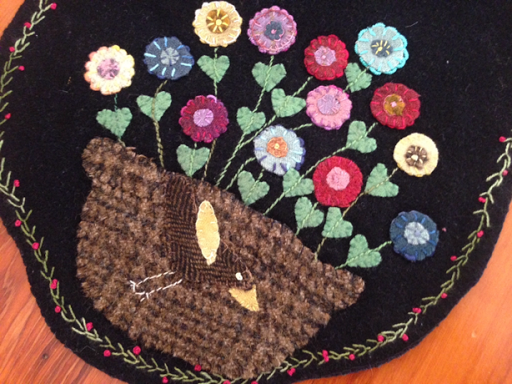 From the scrappy original sketch to every single hand stitch, it is my own work, and a personal goal achieved. 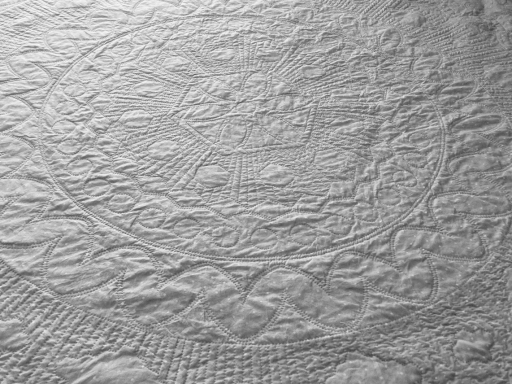 The icing on the cake was being approached to make a pattern for my quilt, and it will soon be available to purchase from De Quiltster in the Netherlands. Hats off to all the wonderful designers who do this for a living, pattern writing is hard! If you're interested in a copy, please email me. 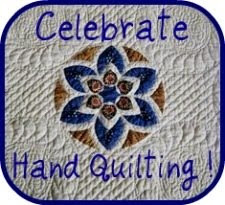 I hope everyone in blogland is well and happily stitching away. I'm more often found on Instagram as Thimblestitch1 these days, so pop over and say hi. 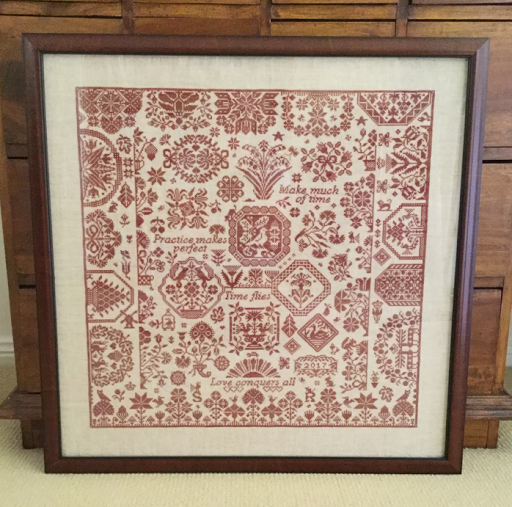 I finally got my Scarlett Ribands cross stitch back from the framer on Friday. After some concerns about a few wrinkles, I am thrilled with how it turned out. I plan to hang it above my bed, but it may just stay in the lounge room for a while so I can show it off! Surprisingly difficult to photograph it without reflections, but I think you can get the idea. I am still knitting socks and quilting my Doing the Rounds quilt. I have one corner left to go so it should be finished soon. A few ideas for the next quilt floating around, possibly red and white, or blue and white. I'm concerned I will find them boring to work on after a while, but I do love the end results. 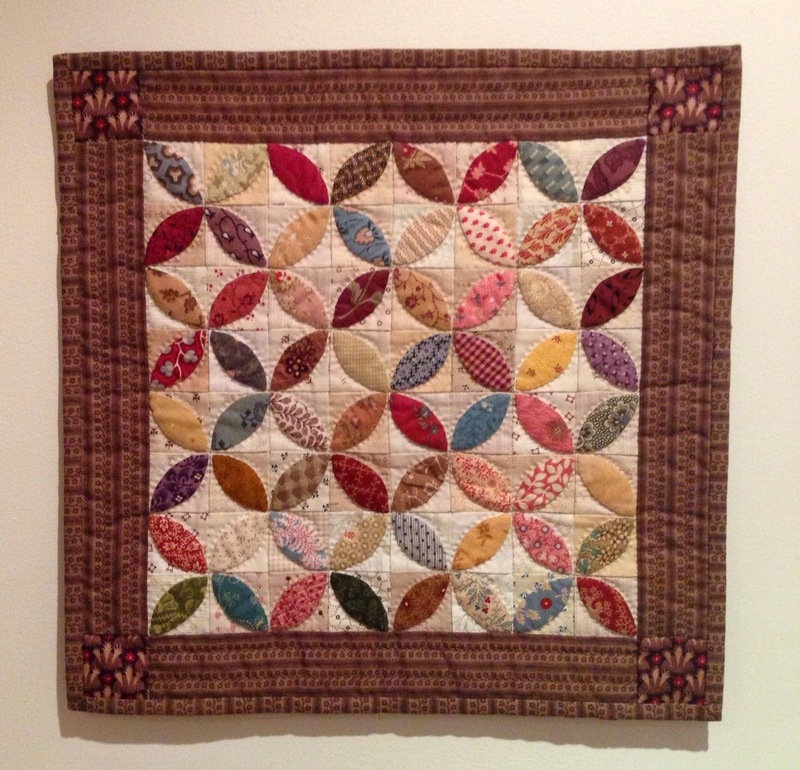 Red and White Quilts - Infinite Variety is probably my favorite book. Work and family have been busy. My second son has turned 18 and is well into his final year at school, and we're wondering where life might lead us next. Hopefully I can get back to posting on my blog a bit more regularly. I do still cruise around your blogs, just not so much commenting these days. I'm Thimblestitch1 on Instagram if you have it, not so many words but more pictures. Hope you're well and finding lots of spare moments to be creative. Scarlett Ribands is finished and at the framers. I am SO excited to see how it will look. 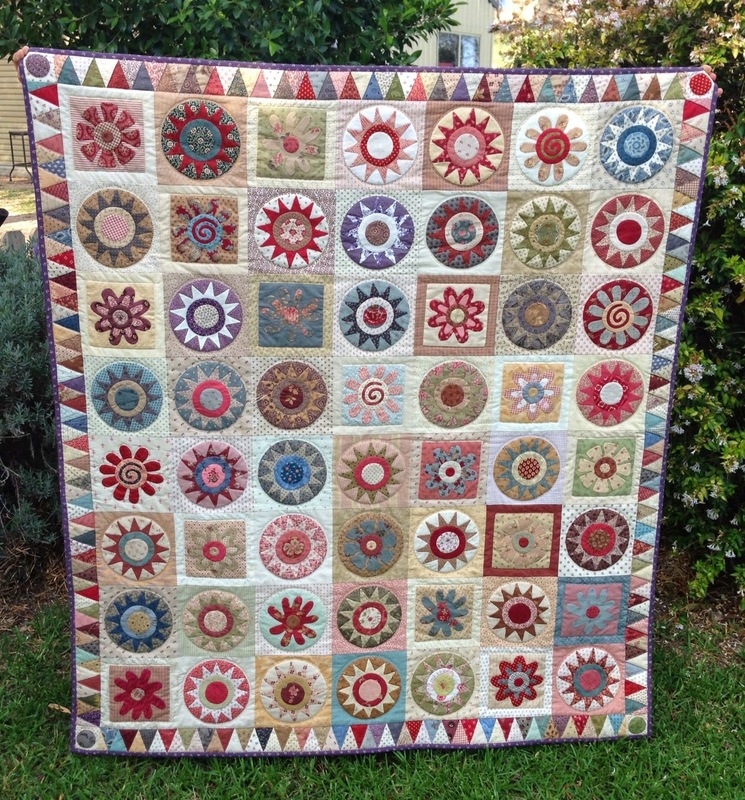 I've been quilting Doing The Rounds a little in the mornings when it's cool enough. It's been way too hot for it most days. This is how it's looking from the back. I knitted a pair of Honey Badger socks for my MIL birthday. It was a personal best, I finished them in less than a week! After my shawl disaster last year I'm trying again. 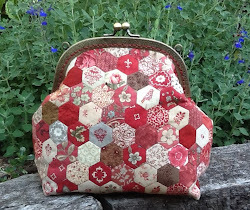 This pattern by Curious Handmade comes with a workshop and support group! 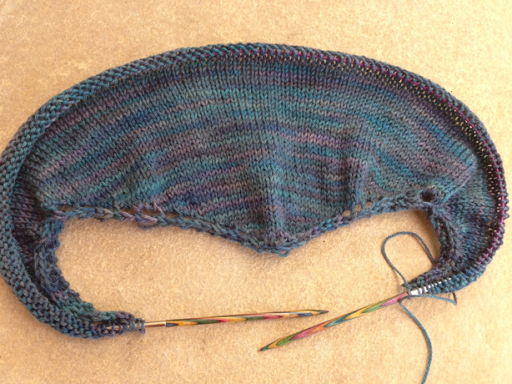 This photo was taken about 25% in, and now I have six very long rows left. It feels very naughty, but I'm planning to sit under the air conditioning and finish it on my day off today. It's proving quite difficult to balance quilting and knitting lately, if only there were more crafting hours in the day. I hope you stay cool or warm this weekend, depending on where you are in the world. I will be bunkered down in the air con, with fingers crossed for no blackouts. Autumn.......you can come anytime! A little sad that my trip was over, but excited to get home and unwrap my SSCS. My poor partner had to wait and extra ten days to hear from me.....my apologies. My gift from Christin in Switzerland is lovely. 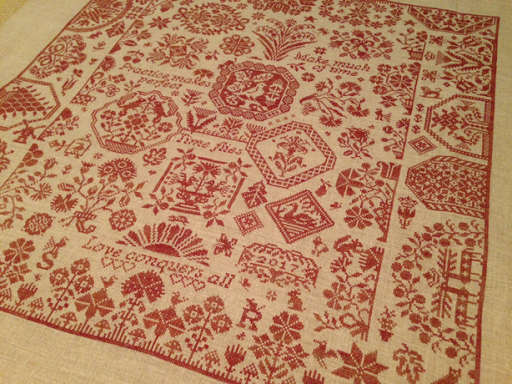 A wool work table runner, with beautiful detail in the flowers. I am a big fan of stockings and this one in felt is so cute. Christin also included a mini calendar and the cutest little flower pins. Thank you so much! 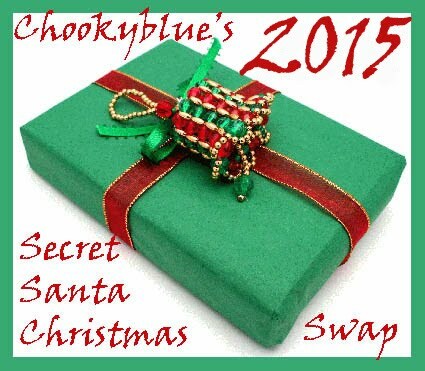 Thank you Christin and thanks Chooky for organising the swap again. After ten days in New York we flew to California, where Mr Thimblestitch tried his hand at driving on the other side of the road. Very interesting, he did well! 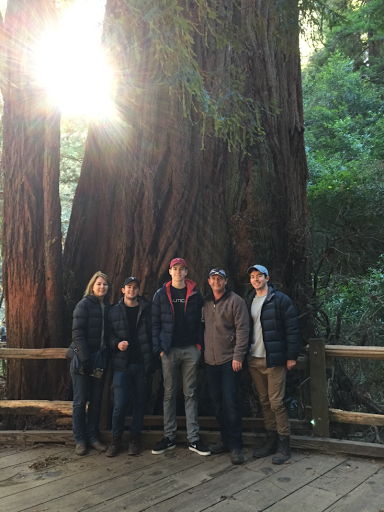 We enjoyed discovering some of the Bay area, I really liked Napa and Sonoma. But my absolute favourite was the giant redwoods at Muir Wood National Monument, they were breathtaking. After three days driving we arrived back in San Francsico. Such a different city to New York, but still lots to see and do. 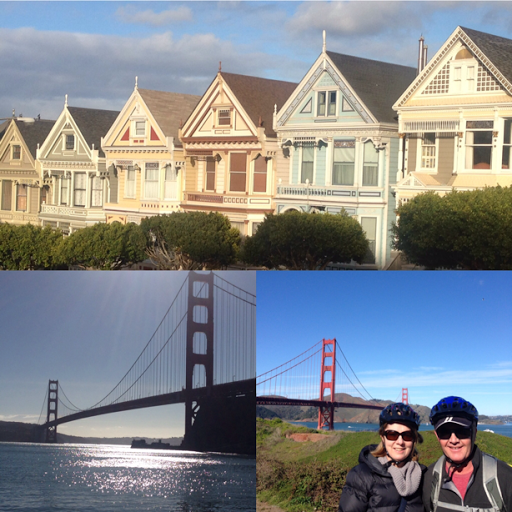 We rode bikes over the Golden Gate Bridge, rode the street cars and cable cars, toured Alcatraz and really enjoyed the steep hills and beautiful houses. 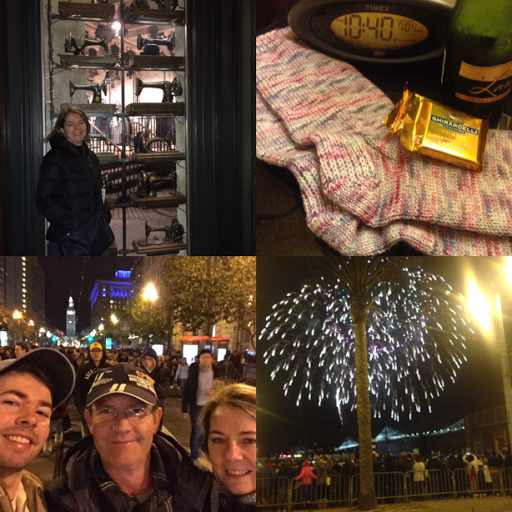 New Years Eve was a little quieter as coughs and sniffles started to slow us down. Those of us who could, walked to the Bay Bridge for fireworks. Whilst I'm not usually a fan of big crowds, it was a great celebration. Socks finished just in time for the end of 2016! Wherever I go I usually check out the patchwork and now wool shops before I go. It's always interesting to see (and buy) something different. I find the unexpected little journeys into suburban areas really enhance my trip, whether it's in Australia or overseas. They take me to places I might not otherwise go. 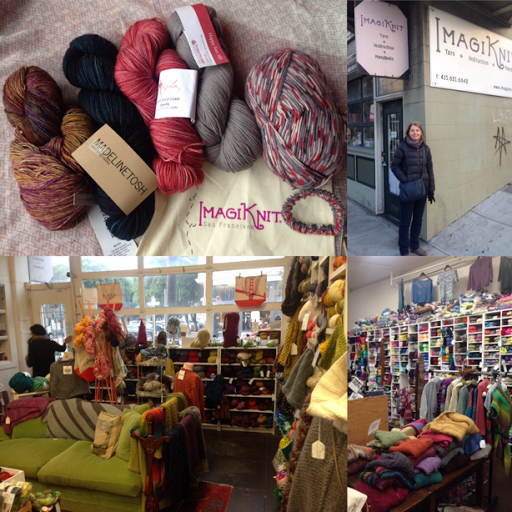 In San Francisco, DH and I ventured out to Imagiknit. What a fantastic store, I wish I'd had more time, more money and more knitting skills to take full advantage of it! We had such a good time. Lots of adventures and experiences, so lucky with mostly great weather. I didn't think I would ever do a trip like this with my children, but it was so special to have this first big overseas experience together. Our trip broadened our horizons and made us appreciate our own country more. 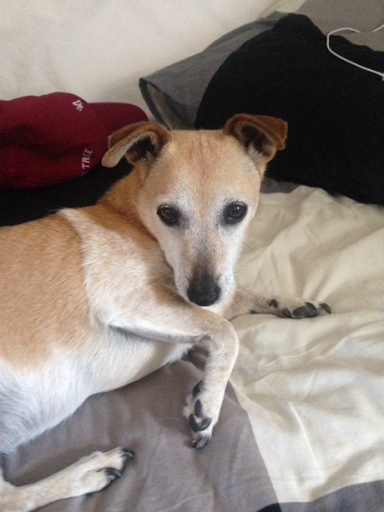 Home to my beloved hound. Back in a minute to show you what I got in the SSCS swap!